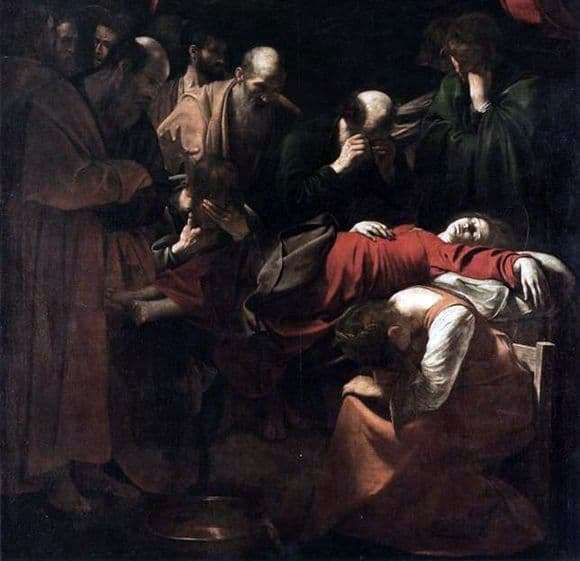 One of the paintings by Caravaggio, commissioned by the church, but rejected because of unconventional revolutionism – “The Death of Mary.” Created an amazing canvas was by 1606. It was a period of late, mature creativity of the painter. And in the picture, all the techniques acquired by Caravaggio during the years of artistic work reflect the images of figures, the background and their interaction. “The death of Mary” is striking deep emotional power. At first glance, one feels the sorrow of the assembled apostles and Magdalen around the dead Mother of God. The heartache on faces and in eloquent gestures infects the viewer and plunges into anxious thrill before dying. Many connoisseurs of the masterpieces of Caravaggio consider the presented work to be the most tragic. The drama of the mournful scene at the bottom of the picture is ingeniously underlined by the illuminated red curtain at the top. The main color of the canvas is blackening dark brown, it is diluted with patches of saturated scarlet hues and bright highlights of light. It is the light that acts here as a graphic tool for the transfer of the spiritual elevation of the canvas. Another method – the position of the body of the Mother of Christ – is lying on a surface elevated from the ground, as if floating in the air: there is no support at all under your feet. The church at that time failed to discern the riches of the spirituality of the work performed. Even the thread of the halo at the head of the Mother of God did not convince the representatives of religion. They wanted to see the triumph of the resurrection, for Mary, after a long life, was to meet her beloved son in heaven and find happiness. And the artist, in their opinion, did not give even a hint of the authentic bible plot. Moreover, it was believed that the model for writing the figure of Mary, he chose a woman of easy virtue. But still there were connoisseurs of the talent of the painter, who have kept a wonderful masterpiece, and now it can be seen in the Louvre.